● Capturing video can mitigate expenses associated with patient sitters, drug diversion, other theft, and false accident or injury claims. ● Hospital personnel gain earlier awareness of incidents that can compromise patient safety by using video analytics software to send an alert based on loitering, boundary crossing, or queue length. ● As part of emergency preparation, video surveillance provides situational awareness to help officials plan an effective response. Healthcare facilities hire patient observers (sometimes called patient sitters) or assign staff to monitor patients at risk for falls or on suicide watch, and those who are confused or agitated. Unlike private-duty personal care assistants, a patient observer’s sole responsibility is to notify staff when the patient engages in potentially selfinjurious behavior, such as getting out of bed without assistance or pulling out tubes. Observers generally receive hourly pay, an unreimbursed expense. Some healthcare facilities must ask the patient’s family to provide sitters, imposing a burden for working family members. Healthcare organizations can lower the costs of patient observation using high-definition (HD) video surveillance and two-way communications. 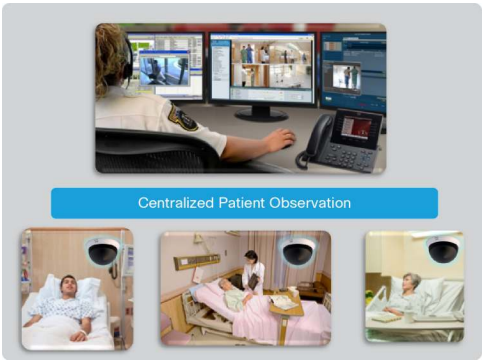 With the Cisco Virtual Patient Observation solution, trained staff in a central operations center can observe multiple patients over the facility’s existing network, quickly alerting staff when intervention is needed. For patient privacy, the solution transmits live video only, and does not record. In crowded emergency departments, there is a risk that busy personnel might not notice when a patient loses consciousness in the waiting room, or when an admitted patient has not been checked at the required frequency. More risk occurs when large groups crowd the lobby to wait for news about friends or family. ● Counting the number of people who enter and exit, and alerting security personnel when crowds exceed a defined size. ● Creating an accurate count to help make sure everyone has left the building if evacuation is necessary. 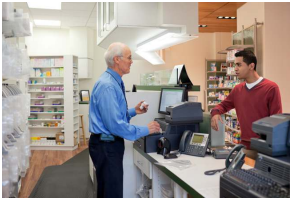 Drug diversion is a problem not only in the main pharmacy, but also in satellite pharmacies, dispensing areas on the floor, loading docks, and other areas of the hospital. One cost is financial loss. Another is the safety risk resulting from substitution of saline for morphine, for example. Video surveillance can also help hospitals identify healthcare personnel who divert drugs for personal use. Prominent video surveillance cameras can help deter drug diversion. It is more effective to transmit video over the network for central storage than to store it locally, because centrally stored video remains available even if the perpetrators damage local equipment. Video analytics software that detects loitering can send an alert if an individual remains in a drug-dispensing area or adjacent area longer than a specified time. Hospitals can also use Cisco Video Surveillance and Cisco Physical Access Control solutions to begin capturing video when someone enters a controlled area, enabling security staff to visually identify people using stolen badges. Some hospitals track infants by giving them a wrist or anklet bracelet with an embedded radio that issues an alert if the infant is moved outside the nursery or unit. Although radio frequency identification (RFID) tracking provides early awareness of possible abduction, hospital personnel do not know what the abductor looks like, and might let the person pass through a door with the baby hidden. By deploying video surveillance cameras in nurseries and other areas, hospitals can capture the suspected abductor’s image to include with the alert. Personnel can view the image on desktops, smartphones, and digital signs throughout the hospital. Hospitals can also use video to monitor patients with diminished faculties resulting from psychiatric or neurological conditions, head injuries, drug use, and so on. Video analytics software can detect when these patients cross a threshold, and then send an alert or take another action. For example, when a confused patient wearing a bracelet with a radio transmitter passes by a Cisco Digital Signs display, the sign can play a prerecorded video of that patient’s family member asking the patient to return to the room. Video surveillance also helps prevent theft and hoarding of equipment as diverse as wheelchairs, medical equipment, televisions, and furniture. Hospitals can affix RFID tags to assets ranging from wheelchairs to medical equipment, and track their location with a Cisco wireless network. The location of the equipment is superimposed on a map of the hospital. 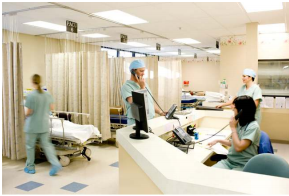 Hospitals that integrate Cisco Wireless Location-Based Services with Cisco Video Surveillance can automatically send an alert to appropriate personnel when items are moved outside a prescribed boundary. Then personnel can simply click a link to view video from the closest camera. Deploying video surveillance in operating rooms encourages staff to follow procedures. This helps to avoid hospital-acquired infections and wrong-site surgeries. To plan an effective response to pandemics or disasters such as earthquakes, hurricanes, or shootings, hospitals can deploy mobile video surveillance cameras on the scene, increasing situational awareness. Viewing real-time video feeds helps personnel ascertain the number of people requiring care, which immunization stations have long lines, and so on. Oakland County, Michigan, and Harvard Kennedy School’s Leadership for a Networked World Program worked with Cisco to simulate a pandemic response. The goal of the exercise was to quickly mobilize vaccine-dispensing locations and the incident-command structure to provide access to life-saving vaccinations. Using the Cisco IP Interoperability and Collaboration System (IPICS), first responders could communicate directly using any device, including radios, push-to-talk (PTT) phones, IP phones, and PCs with client software. Cisco Video Surveillance Manager streamed live video directly to the emergency operations center as well as to participants’ mobile devices. During the successful exercise in Oakland County, officials could view real-time video feeds from the dispensing sites for early awareness of problems such as too many citizens flowing into a particular dispensing location. This intelligence helped other officials make decisions based on accurate, up-to-date information. Unnecessary healthcare costs result from false claims filed by workers or patients reporting falls, needle sticks, and so on. Without a way to refute false claims, hospitals often must pay. By deploying video surveillance cameras in lobbies, hallways, and other areas, hospitals can refer to video evidence to defend against invalid claims. Video surveillance also helps hospital safety and facilities teams monitor parking lots and other public areas for break-ins and suspicious persons. Visible surveillance cameras can reduce crime and fear of crime for patients and staff.